B.C. 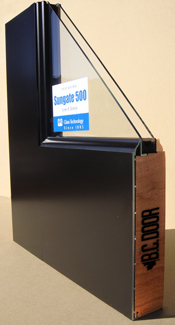 Door offers our Full Lite French Door (pattern #110) in a Metal Clad option. Our metal clad door was designed to excel where other clad systems faltered. Current clad systems on the market look cheap and under-perform. Our goal was to develop a system that “has both form and function” to meet our exacting quality standards. Our exclusive metal clad system has been designed to imitate the appearance of a finely painted wood door on the exterior face, while offering the beauty of a true solid wood door on the interior. Prior to assembly, all wood to be covered by clad is treated with an anti-bacterial & anti-fungal sealer to inhibit expansion/contraction of the wood and prevent mould and mildew. 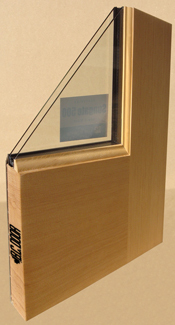 At the time of manufacture, the clad is wrapped around the wood and secured in place by construction adhesive, mechanical fasteners, and caulking to ensure a weather tight seal. This system is truly unique in that it is not available anywhere else. Our in house design team spent countless hours on this project to develop a superior product and it shows with the finished result. Please specify 'metal clad' when requesting a quote or ordering. Baked Enamel finishes are available from the factory in black, brown, or white. * Please see our Handling, Job Finishing and Installation Instructions for complete re-finishing information.